Today's challenge at SCS was to do Paper Tole. I think I was supposed to do more than one layer, but I was just too tired to do any more! This cardstock was already cut from a workshop I had on Saturday, so I just used what was laying on my desk. The boat was stamped in Brilliant Blue, then again in Certainly Celery & Bashful Blue, and I cut out the different sails and popped them on. Stars were stamped in CC, the words in BB. I drew a stripe on white grosgrain with my BB marker, then attached it with a blue brad. The whole thing was mounted with dimensionals. 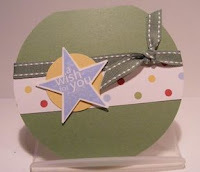 A cute, quick easy card for either a little boy or a BIG boy!!! This is a fun technique, I did actually do another card but it was lame....maybe I'll post it later. Yesterday I had a downline meeting with my fellow "Wee-Inkers"! We have these meetings four times a year--we talk about business, demo new techniques, give each other tips and helps, talk about new products, and of course, we stamp! I am continually amazed at the talent these girls possess! Our swap challenge was to make a card that was not a regular card size. These are the beauties "my" girls came up with! In the next couple days I will show you the make and takes we did as well! I hope you enjoy them and are inspired by them too! Just playing around with some of the stamp sets that I don't use a lot. This is from Crafty Secrets called Tea & Coffee...I love their designs but sometimes I feel as though their images are not as clean & crisp as I would like. Maybe it's just me!! 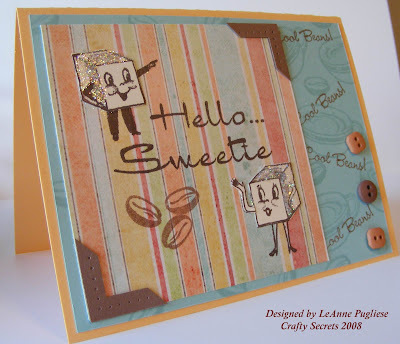 Anyway, these little sugar cubes had never seen ink, so I stamped them on a piece of digital sb paper from Shabby Princess and then stamped them again on Very Vanilla, cut them out and adhered them over the original stamped image. I picked up some colors from the striped paper for my background & card, stamping the background with the coffee cup and coffee bean. I added "Cool Beans" from MFT to follow the coffee theme. I added little photo corners and some neglected buttons, then finished the sugar cubes off with a sugary coating of glitter! Thanks for looking! Boy, you can't get much simpler than this. I needed a thank you for a hostess who placed an order with me, and I wanted something quick & easy. I always like to make a card using the set that they earned, if I have it, and luckily, I did have this particular set: For A Friend. I really love all the images in this set--you can do so much with them; leave them simple or add layers and embellishments. I chose just to highlight our Summer Picnic Designer Paper. Three strips on a Bashful Blue card; the image stamped in Black Stazon & colored with markers, then a Pumpkin Pie mat that was pierced with the tool from my Tool Kit. I adhered it with dimensionals, and it is ready to go! I am skipping right over spring to summer! Sharon Johnson's challenge today was Paper Piecing. 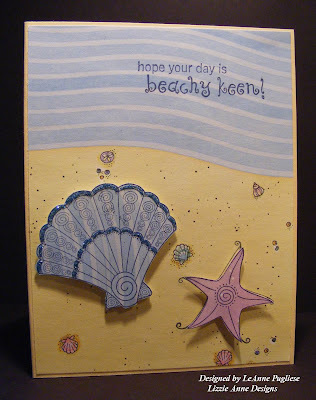 My supply of outline stamps is slim, but I found this really cute beachy set from Lizzie Anne called Shore Thoughts. I LOVE this set!! I also found some adorable scrapbook paper at the Dollar Store called Miss Elizabeth's Bryce & Madeline Beach. The water & sand are all one piece, all I had to do was cut it to fit my card! I pieced the large shell and starfish, popped them up on dimensionals and added some of the new SU glitter! Gorgeous stuff! Click on the photo to get a really good look at how cute this is IRL! I added the sentiment and I am done! Easy peasy! Can I tell you how much I like this card? I am so much happier with this one! Check my previous post to understand what I am talking about! Thursday's "Ways to Use It" challenge at SCS is to spray something on your card. 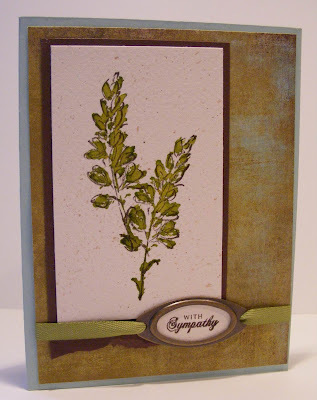 Unfortunately, I need a sympathy card today, but I really had fun trying this technique that Beate taught. I didn't use markers, I just used my Old Olive stamp pad. Can I tell you how much I love Papertrey's Mixed Messages set? I thought they were too small, but they are easier to use than I anticipated, and they fit nicely in my small oval punch, which means they fit nicely in my Hodgepodge Hardware. Can you tell how much I love this Olive twill? It looks so nice with my Figgy DP and Papertrey AquaMist cardstock. I also "sprayed" some little flecks on my image with a paintbrush & some watered-down Close to Cocoa ink by flicking it with my finger. Click on the photo to get a closer look. Boy, I like this card, hope you do too! Can I whine a while? Can you put up with me? 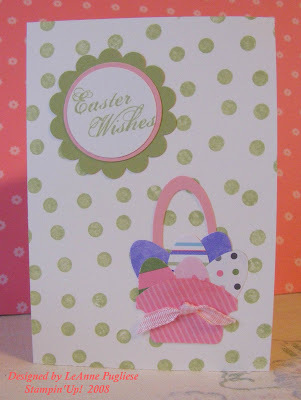 I really do NOT like this card....it looks like something a first-grader would make. 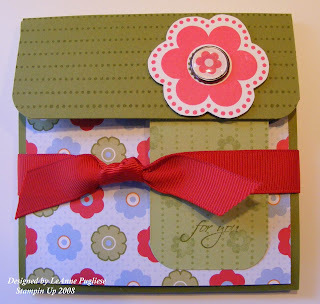 Today's challenge at SCS is "Why Oh Why"--you are supposed to use an "unloved" something that you just had to have, on a floral card. So my choice was chipboard. 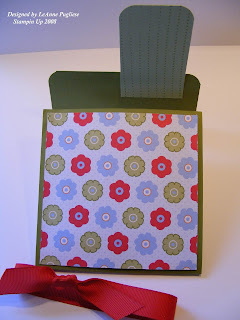 I think it is fine in a scrapbook, I just think it is too clunky on a card. So anyway, I covered a chipboard flower with dp, added a chipboard center, and a clear button (another thing I just HAD to have). 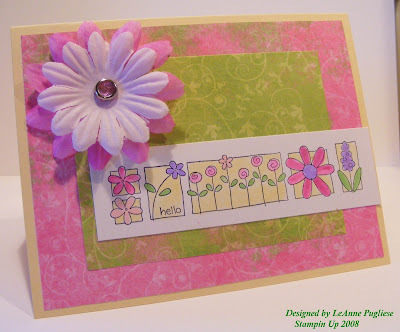 SU's new colored twill is my stem & leaves (something I DO love) and I used my Rough Edges Alphabet to stamp "bloom". Oh well, I guess you can't love them all, right? Wow, I got another "award"!! 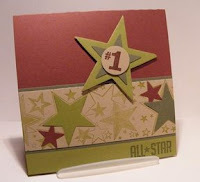 This one is from my new blog friend Julia over at Create With Me! What a sweetie, and an excellent stamper, too. Be sure to check out her blog, she has lots of creative ideas. 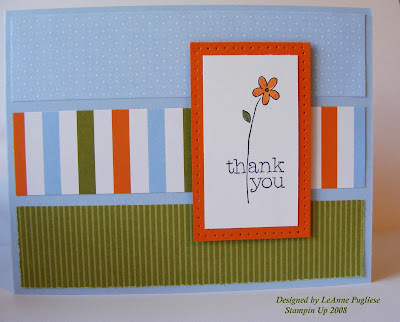 So I am supposed to pick five other stampers and award them with the "You Make My Day Award"! So here they are....be sure to check them out! I have been very busy again, with barely any time to stamp! I played a little hooky this morning since I wasn't feeling real spiffy, but I did stamp one card. 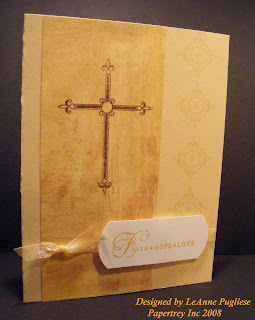 I am demoing the technique of stamping on vellum, then coloring it from the back, at my downline meeting this weekend, so I wanted to have a couple samples to show. I had stamped this butterfly a couple days ago, so I incorporated it into today's SCS Sketch Challenge, which can be seen here. I know butterflies don't grow on stems, but hey, it's my stampin' world, so that's why it's called a "Fanciful Butterfly Flower"! This also fulfills the Color Challenge from Tuesday, which was to use Basic Gray, Soft Sky & Whisper White. It's a fairly simple, straightforward card, not much stamping, actually! Hope you enjoy it and your day! Wow, the Inspiration Challege at SCS was a beautiful silver & beach stone charm bracelet in the most gorgeous shades of blue--I coveted it until I saw the price!! Yikes! I had purchased an older SU stamp set at a yard sale. I don't even know the name of it--a set of three bold seashells and a lobster. I hadn't even inked it yet! But I thought they would be a pretty match for this challenge. The shells are inked in Soft Sky on Very Vanilla and mounted on Brushed Silver. The Soft Sky card has another piece of Miss Elizabeth's Outre DP from the Dollar Store mounted on top; the shells are mounted on top of this. The silver brads, on which I thought kind of looked like a sand dollar design, are added for some extra silver interest. 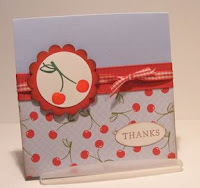 A very easy card; I left off the sentiment so I can add one later when I need a specific card. I think this color is hard to photograph--I hope you can see how pretty it is! Thanks for looking! Last post for today....a blustery, cold, very un-springlike day. The sun is shining but it is NOT warm! 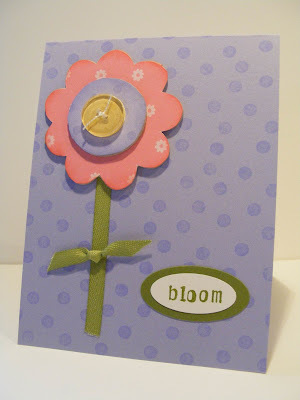 So this card is supposed to make me feel more springy! I had been wanting to use this hostess Level 1 set for a while, just hadn't gotten around to it! I played around with dying the Pretties flowers with reinkers, but I need to experiment some more to get the right color. This is also a submission for Beate's Weekend Sketch. Hope it makes you feel like spring, too! 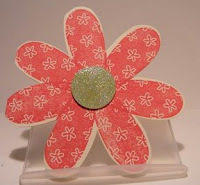 This is a little notecard set for a special someone.....she'll know when she gets it who she is!!! Beate had one of these on her blog (scroll down a bit), and I could see how it would be very simple to make, especially since the Tart & Tangy set and the Summer Picnic DP go together so well! I added a flower from Enjoy Every Moment, embellished it with a Build-a-Brad and tied it together with that wonderful wide red grosgrain ribbon! The business size envelope inside is folded in half and trimmed, and holds three mini notes & envelopes. I know I'll be making these often. This also qualifies for Sharon Johnson's challenge ssnotime27--Round Corners. Thanks for visiting! It would be nice if I came up with an original idea, but there are so many good ones out there, they are just begging to be CASE'd!! This one came from Leslie Miller, you can see it here. 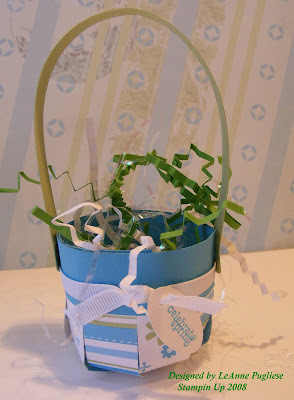 It is so cute and so easy, you will still be able to make some QUICK for Sunday!! I am going to fill mine with Hershey's kisses and give it to my niece when I visit for Easter. I didn't do any stamping on this one (I think little flowers around the band would be nice), except for the little tag. Have fun with yours! I need to send out a baby card, and this is a repeat, done a little differently, but still cute. 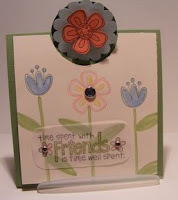 It is one we did at a workshop I had on Saturday, and you can find the details at Lauren Meader's site. I was highlighting the SAB sets, so that's what I put on the front, plus using the green made it a go for either a boy or a girl. 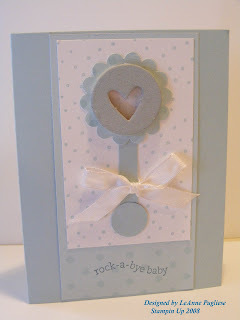 The rattle card was an outright copy from Laura Frederickson's tutorial on chipboard you can see here. The little rattle is actually a window made from chipboard, and inside are little tiny microbeads. So when you shake it, it actually rattles! How cute is that?! To get a better look, click on the picture. 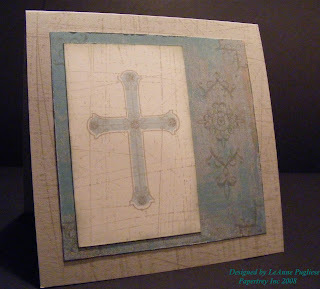 This was a big hit at the workshop, and I was able to sell some chipboard, even though I didn't demo it! I made mine a bit differently, but used her tutorial for the rattle part. Hope it inspires you to try it, her instructions are great! Thanks for looking! This nice blogger, Katie, posted on her blog as to how to add a signature. After much trial & error, because I just am not too computer literate, I think I figured it out. How do you like it? You can check out her post here. I was tagged by Julia, whose blog has LOTS of neat cards--a very creative person! I am supposed to tell you 7 things about myself. You will probably find these things boring!!! I prefer most things that I eat "homemade". I brew my own iced tea, with real lemons; I don't like boxed brownies (they taste artificial) and if I could figure out how to make my own yogurt, I would. I just have been too lazy to look up a recipe! I did my first craft when I was about 9 years old. My mother bought me a crewel pincushion for Christmas, which I finished that afternoon! I have been sewing since I was 10, cross-stitching since I was 20, and stamping since I was 45. I made my little brother shorts, my sister her prom gown, my college roommate HER prom gown, my wedding gown, and all my daughter's dresses when she was small. I square danced for about 10 years (made those dresses, too!). It is great exercise and a lot of fun. My husband does not share that sentiment. I have been married three times (not something I am proud of, but it is what it is!) and all my husbands' last names have started with the letter "P". So I got to keep all my monogrammed sweaters!!! LOL! I, like Julia, am also a list person. I LOVE crossing things off my list. I will put something on my list that I just did so that I can cross it off--just kidding. But they do help me stay on track and sane with all the things we women have/love to do! I love to do crosswords--the harder the better. I have an online subscription to the New York Times just so I can do their puzzles. Sudoku too. Now, I am tagging Maren, Kim, and Jodi. Have fun! Whew! I was beginning to think I was never going to be able to do a challenge again! So busy! 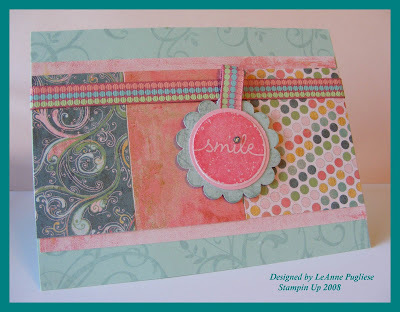 I am glad I got to do the Sketch Challenge because it was from one of my favorite stampers, Laura from ScrapnExtras. She has so many good ideas and so much talent, looking at her blog is one of the highlights of my day! I also did the Ways to Use It Challenge, which was to use a tag. I used another piece of Papertrey Aqua Mist card for my base and added some delicious DP from Basic Grey--hey, I'm on a roll with this stuff! 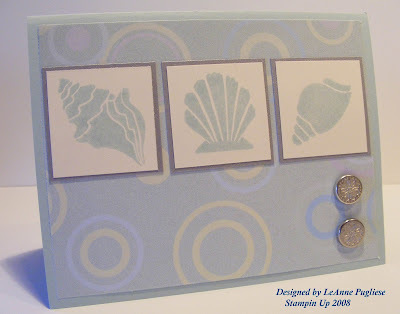 I stamped swirls from Baroque Motifs in Soft Sky, and also used Soft Sky to stamp Sanded on a scrap for my scallop punch that made the tag base. I echoed the circles in the DP by stamping "Smile" from SU's Be Happy, which is a very happy set!! The ribbon is from Michaels, and again, it carries that circle theme. I added a little rhinestone bling on the tag, and that's it! This will go to my friend who just gave me a very nice gift certificate for a local restaurant!!! I did a little stampin' thing for her Girls Alive group at church, which was so much fun--but getting that gift certificate was fun too!! Yum, I can't wait to use it! Thanks for looking! This is just a quickie--I had this image all punched out and then never used it, was going to throw it away. I was looking through my Basic Grey Two Scoops, and this paper jumped out at me, so I rummaged til I found my almost toss-out and matched it up. The base is Blush Blossom--there's a color I rarely use! But it goes well with this DP. Now it's going out in the mail or it won't get there in time! Edited to add: Wow, look at the dust on my figurine! 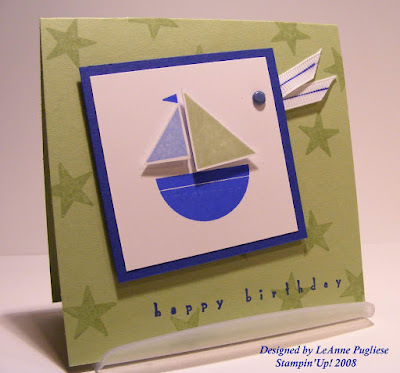 This is my first card "breaking into" my Aquamist stash from Papertrey. Too bad I covered it up with DP!!! I found this color hard to photo--the first one I took came out lavender!!! It is so pretty IRL. The DP is Miss Elizabeth's from the Dollar Store; stamp is SU's level 1 hostess set For A Friend. 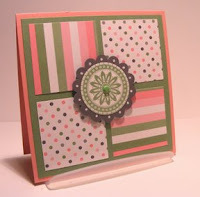 This is a great set--I made up 4 quickie cards yesterday in just a few minutes with this set. The images are all stamped on cardstock-weight vellum. They are colored in on the back with markers and dry white watercolor crayon. 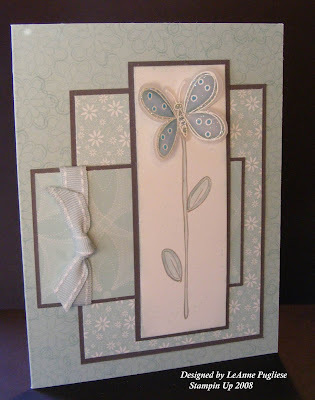 The sentiment has a small piece of white cardstock behind it to lighten it up, and the butterfly and flowers have some DD glitter. Click on it to get a nice close up of that delicious glitter! 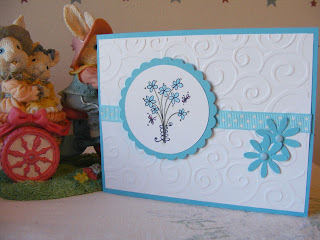 A nice springy card! I had a reader (thanks Billie) ask me if she could subscribe to my blog....I had been dragging my feet because I thought it would be too difficult to set up. But I tried it, and hopefully it will work!! So if you want to be notified when I have a new post, just put your email in over on the FeedBlitz link on the left. Then magically when you get up in the morning, my posting will be there. I hope! I signed up myself, so I will be able to see if it works or not!! I would like to take some time to wish all of you a Happy Easter. Did you know that the word "Easter" is not in the Bible? Some of us call it Resurrection Sunday because that word better describes the event that we are celebrating. It's fun to have dyed eggs and chocolate bunnies, or in my case, M&Ms, but it is my prayer that all of you will be reminded of the wonderful gift that Christ gave us by dying on the cross. It should be the focus of all our lives. 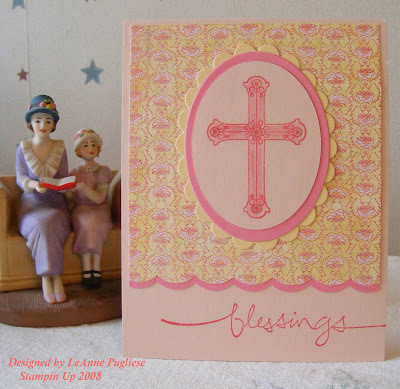 I finally did make a couple Easter cards using my new Papertrey set, Everyday Blessings. What a wonderful set! I just wanted to keep playing & playing, trying out all those little swirls and fleur-de-lis and verses. I can see this is one set I will keep on my desk and use often. These cards are very simple, the recipes will follow. 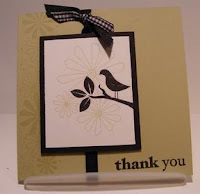 Thanks so much to Grace (scrappigramma2 on SCS) for her advice on photographing my cards with a black background. I will say I really like the way the sahara one came out; I am not sure why the saffron one looks different. I'll have to keep experimenting! You can click on the photos for a closer look. Thanks so much for looking. I have another card coming up if I EVER get back to my desk! This card looks better in real life, unfortunately I didn't take a very good photo of it!! And it's already in the mail, so no do-overs!! I got the idea for this here. 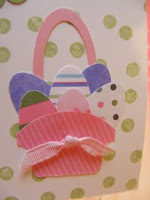 Her little basket is quite cute, and has more detail than mine, but I was in a hurry and wanted to do some assembly-line cards, so maybe I'll try some again later--hopefully BEFORE Easter! I think my background is a bit too busy. Anyway, it's all Designer Paper and punches. The handle uses the large & small oval punches; the basket is the tag punch. The eggs are the small oval punches, too. You can see lots of possibilities here--come up with some creative combinations on your own. Go for it and see what you come up with! Carrots are Good For You, Right? Well, this cute little carrot is not filled with beta-carotene, but cocoa, sugar and other fattening goodies--namely, M&Ms!!! I got this pattern from Wanda at My Creative Corner. She has a plethora of patterns---a very creative corner indeed! You must check out her blog for all her goodies--be sure to look at her little bunny's behind!!! Anyway, this is a goodie for my niece & nephew, along with some other things....as an aunt, I am allowed to do this, regardless of what my sister says. Shoot, she fights the kids for the stuff in the box, she isn't kidding me! The pattern was cut out of Only Orange cardstock and wheeled both ways with the Dotted Lines wheel, as was the top. The image was stamped with a clear stamp from my friend Georgette and backed with a scallop stamped with the snowflake from So Many Scallops. I made my own tag--the images are shown both with & without the tag. I made a mask of the bunny face and sponged around it with Apricot Appeal and colored it with markers. The little fringed carrot top was just a piece of cardstock crimped and cut, then put together with brads so they won't have to rip it open and MAYBE they can use it again! Lots of fun and cute to make. I will say that the little tab on the pattern is a tad small...when I cut mine out, I added another 1/4" just so my sticky strip would have more of a base. Hope you will take time to make one too! Isn't this a sweet card? My friend Beth sent me this card and I just had to share it. The image is a new Elzybells design! You can see it here. It is called Daisy bunch and is from the Friendship line. 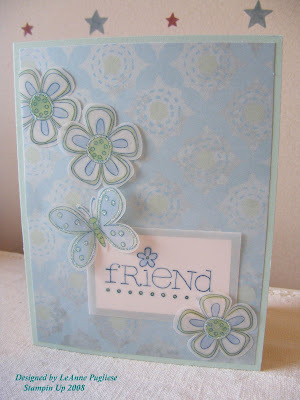 I love all the elements she used----Cuttlebug, ribbon, scallops, flowers--so fresh & springy! Thanks Beth! This card SHOULD have taken about 5 minutes to make, but it took a tad bit longer since I just could not get my sentiment the way I wanted. The stamp is from Holiday Blitz says "My Mom", but I didn't want the "my". 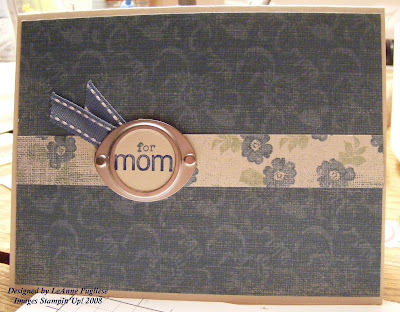 I finally decided to ink the "mom" with a Not Quite Navy marker and stamped the "for" with Blue Bayou. I punched it out with my 1" circle punch and mounted it behind one of the Styled Silver Hodgepodge Hardware frames. I really fought buying this HH but it is SOOOO pretty! I don't think I will hoard these as much! The dp is Porcelain Prints, mounted on Naturals Ivory, as is the sentiment. Easy peasy. BTW, this is one of the first pix I took with my new camera; didn't even stage it, just set it up on my messy table & took the picture! Yippee! I finally got a new camera--I am still learning the various functions of it, but I had a chance to stamp very briefly this week (two workshops and one club in three days--wore me out!) so I am posting what I've got. These are VERY simple because I just wanted to have a couple samples showcasing the Occasions Mini. There'll be more this week--I promise! 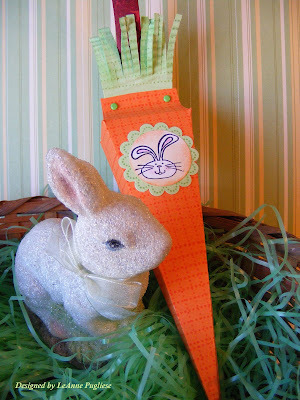 I have at least one cute Easter thing I CASE'd I want to get on, so check back! I needed a quick get well card for a man at our church. 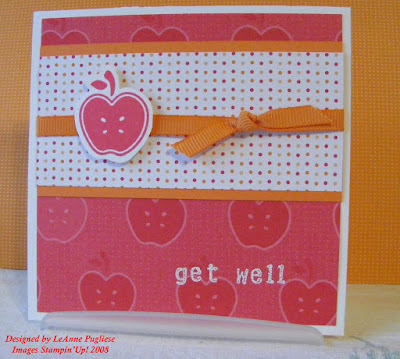 I was playing around with the apple stamp from Tart & Tangy, and came up with this first card. I don't have any current sentiments that say "Get Well" except for Sincere Salutations, and that just didn't fit this card. So I used my little alphabet set that I just had to have, Rough Edges, and I stamped the words in craft white and embossed with white ep right on the Summer Picnic designer paper. Simple, simple, simple! The second card is to send with one of my ebay sales--I always like to include a little card when someone buys something from me on ebay--you never know where it might lead! 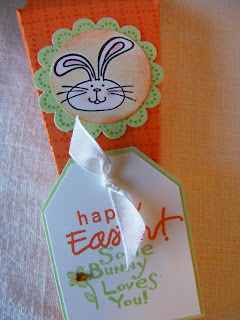 I used a rub-on from the Cherished Memories rub-ons to accent the wide grosgrain ribbon. 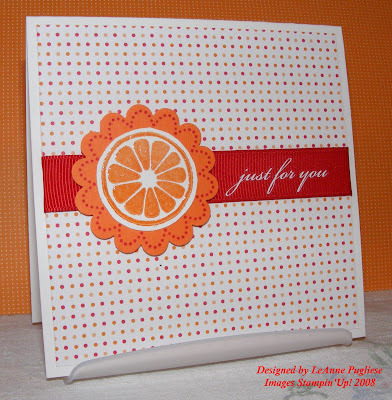 The orange slice is stamped in craft ink and embossed with clear ep; it is mounted on the snowflake stamp from So Many Scallops. A last hurrah for SAB!! 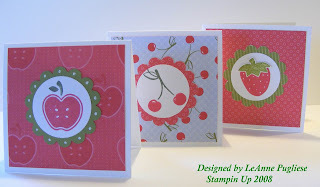 I am glad it is almost over, but I will miss demo'ing this set....there are SO many uses for these stamps. If SU wanted my opinion, it would be to put this set in the upcoming catalog!!! But they haven't asked me! Hope you enjoy these & stop back!